Biolanic is a privately owned company specialized in distribution of non-carcinogenic plasticizers for tire and rubber industry (TDAE, MES and TRAE process oils), emulsifiers, polymerization reaction initiators and antioxidants for rubber industry, gum rosin-based resins for tire manufacturings, pine oil and a-terpineol. We perform logistic operations, using modern and efficient logistic concepts, and offer flexible commercial conditions. Biolanic Sp. Z o.o. was set up in September 2010 and is demonstrating ever since impressive growth rates due to its special focus on the clients` needs and constant efforts to reach the highest possible benchmarks in day-to-day work and in the quality of the services provided. Holding Company - second worldwide producer of green and human-safe petroleum-based process oils for tire rubbers and compounds under the in-house technology(Orgkhim website). 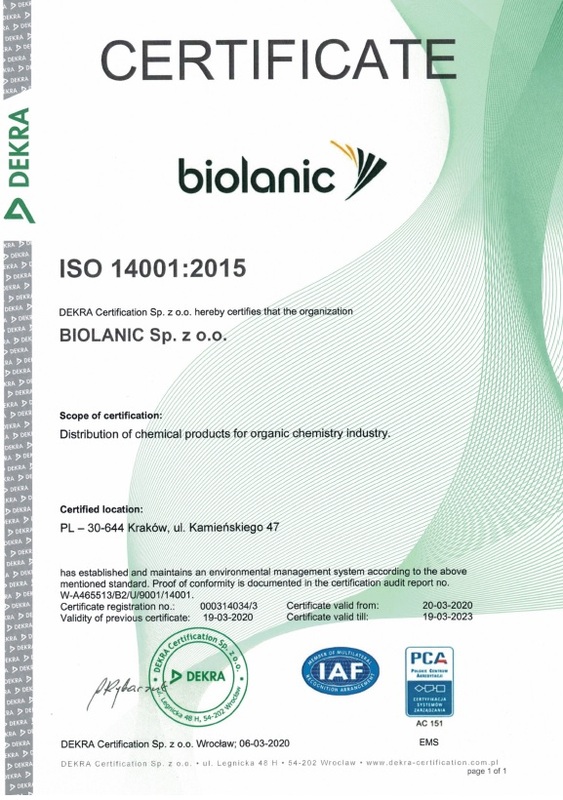 Our mission is to offer best-in-Class distribution and logistics services to our customers delivering high-quality, eco-friendly products of "green" chemistry in a reliable, secure, safe, environmentally responsible and cost-effective manner. We propose to our Clients tailored conditions of just in time and vendor managed inventory logistic schemes, covering the necessary investments of stocking, financing the lead time and offering required payment terms. Biolanic Sp. z o.o. places particular emphasis on continually improving of quality of services and products. 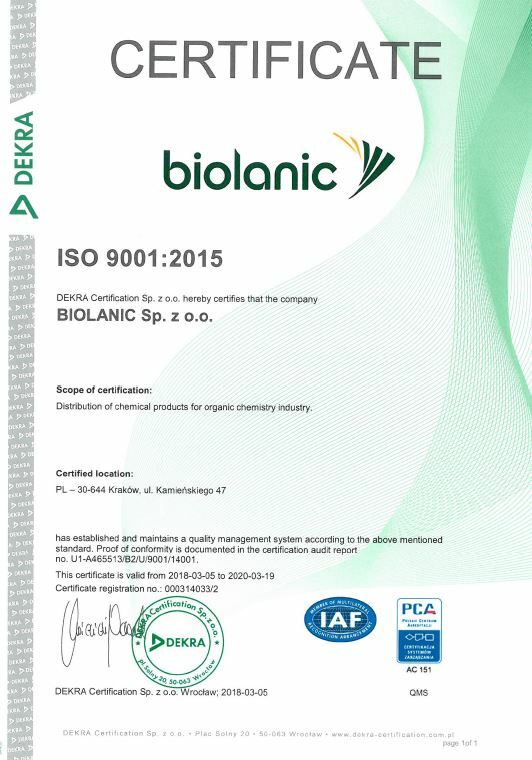 In order to satisfy customers and for the environmental protection, the Company maintains and improves Integrated Management System of Quality and Environment according to the requirements of EN ISO 9001 and EN ISO 14001 with the elements of ISO TS 16949. 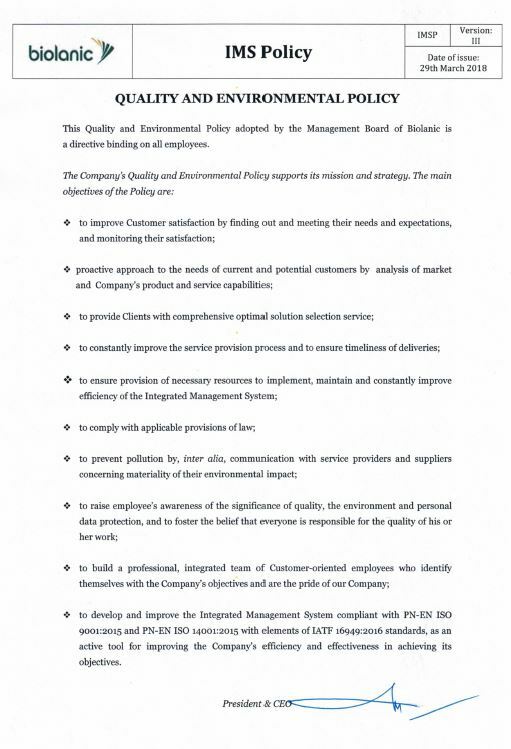 The company finances charitable and pro-environment actions each year. 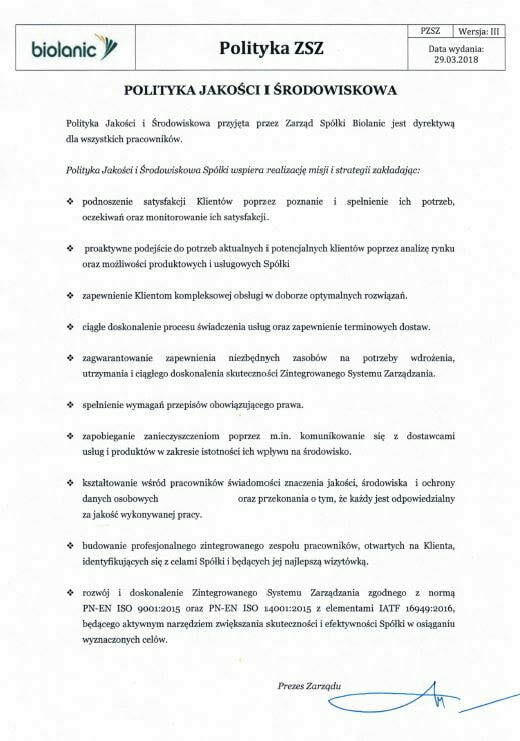 Biolanic funds these actions and the Company's employees are involved directly. Domestic Violence in Krakow. Employees of the Company and their family and friends spent in total 108 hours of work to renew the rooms . Together with the children from Socjalizacyjna Placówka Opiekuńczo-Wychowawcza we planted trees and flowers in their garden. 2015 was even more active. We started with planting trees in Socjalizacyjna Placówka Opiekuńczo-Wychowawcza ​ and Kindergarten Montessori, and finished with more than two -week renovation of Kitchen of St. Brother Albert in Kraków. Biochemical Holding Orgkhim is unique Russian and second worldwide producer of safe petroleum-based extender oils for rubbers and rubber compounds. 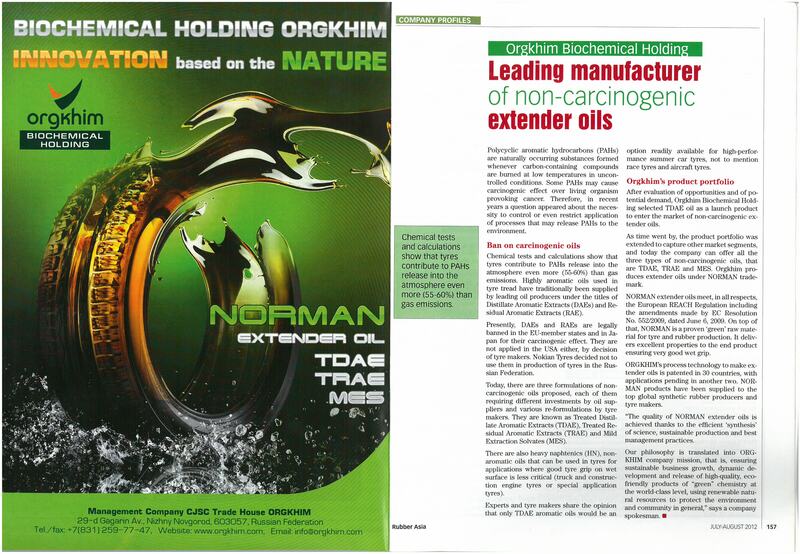 Today, ORGKHIM offers three types of non-carcinogenic extender oils: NORMAN-346 (TDAE), NORMAN-132 (MES) and NORMAN-583 (TRAE). Overall annual production capacity of these oils is 110 000 t.
NORMAN oils fully comply with REACH requirements and meet highest industry standards for process oils. They are used as green feedstock in the production of tires, ensuring excellent wet grip and delivering the best properties to other rubber products. The flagship product of the company is TDAE oil which is widely recognized by leading, industry experts and tire manufacturers as the only option readily available for high-performance summer tires. ORGKHIM obtained patents for its production technology in 30 countries. The portfolio of customers comprises leading rubber producers: Sibur Holding, Sterlitamak Petrochemical Plant, Versalis, Polimeri Europe, LGChem, Lanxess, Styron, Karbochem, as well as global tire makers: Goodyear, Nokian Tyres, Continental, Tatneft, Pirelli, Cordiant, Hankook, Rosava, Sailun, Yongtai, etc.